Minyan Kol Rinah is currently meeting at Kehillath Israel. Please read KI's statement about their relationship with Kol Rinah. Once inside, make a right and walk to the end of the hall. Strollers should be kept outside. KI has always sought to embrace best practices, striving to be a pacesetting institution when presented with challenges and opportunities. Just as we once led synagogues to build preschools (1960s), embrace Zionism (1930s), and establish Endowments to support religious education (1940s), today we seek to be a leader in leveraging shared resources and commitments. Looking forward to the year 2020, we are reconsidering how we use and share our space, how we practice partnership, and how we collaborate with our local institutions. Ever since Abraham was called to strive to be a blessing to humanity, our people's path forward has always embraced this conviction: when we attach ourselves to something beyond ourselves, we can surpass ourselves. Our slogan 'An Ever-widening Circle' takes on new meaning when we partner with neighboring institutions and prayer groups. 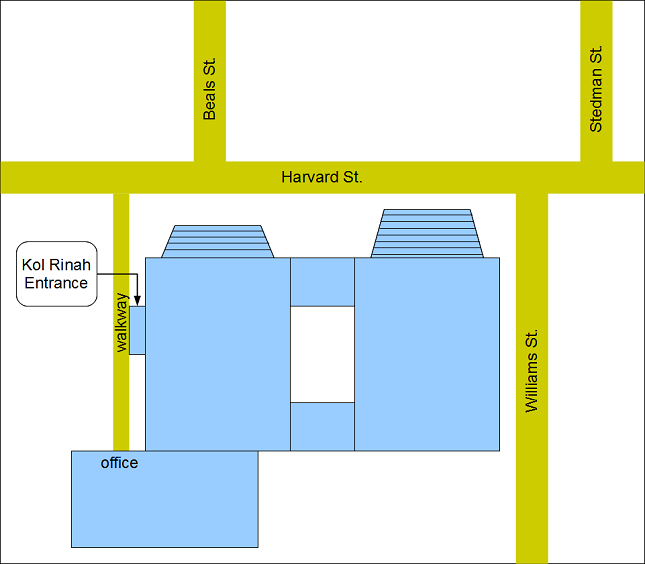 In this spirit, we look forward to welcoming Minyan Kol Rina as they celebrate their first anniversary on March 12th. As this experiment progresses, your observations will matter and help us think more broadly about ways that we can accommodate and be accommodated as partners in our sacred enterprise of growing communities of Torah and Mitzvoth that are morally powerful and personally transforming.